Satiating his love for playing astronauts stranded on barren planets, Matt Damon stars in Ridley Scott’s The Martian, based on the bestselling novel from Andy Weir. When he’s accidentally left for dead on Mars, astronaut/botanist/mechanical engineer Mark Watney must put his myriad skills to the test as he struggles to survive in an inhospitable environment. But this is hardly a solo mission: Damon is joined by a massive cast, with Jessica Chastain and Kate Mara in the rescue crew, and Jeff Daniels, Kritsen Wiig, and Chiwetel Ejiofor among the many NASA employees back on Earth. 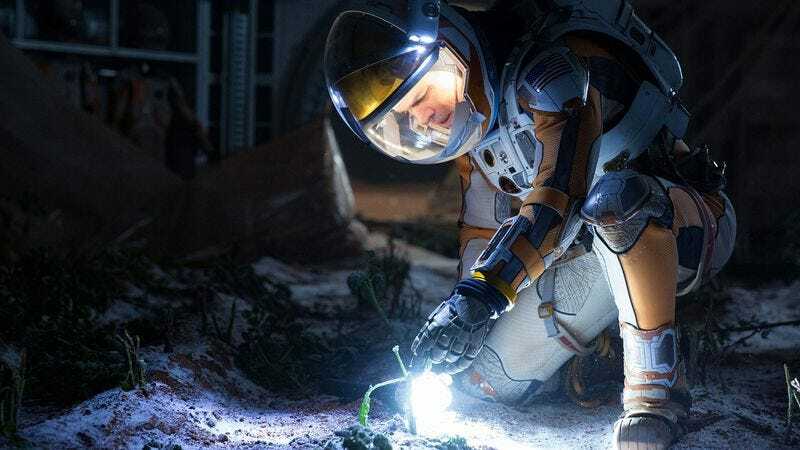 We caught the film last week at TIFF and called it “a corny but genuinely rousing ode to both NASA and science in general.” The Martian opens nationwide on October 2, but The A.V. Club and 20th Century Fox have an opportunity for you to see it for free on September 29. For your chance to win a pair of passes to the advance screening, simply go here and enter your information. As usual, seats will be first come, first served, so be sure to arrive early. An official plot synopsis and trailer for the film can be found below. Based on Andy Weir’s brilliant novel, The Martian tells the story of wisecracking astronaut Mark Watney, a crew member on the third manned mission to Mars. After an epic dust storm threatens the crew’s ascent, they are forced to abort the mission. Watney, separated from the rest of the team, is unintentionally abandoned, with the rest of the crew believing him to be dead. Now he’s stranded millions of miles from the nearest human being, with no way to even signal Earth that he’s alive—and even if he could get word out, his food would be gone years before a rescue mission could arrive. Chances are, though, he won’t have time to starve to death. The damaged machinery, unforgiving environment, or plain old “human error” are much more likely to get him first. But Mark isn’t ready to give up yet. Drawing on his MacGyver-esque ingenuity, mechanical engineering skills, and a relentless, dogged refusal to quit, he steadfastly confronts one seemingly insurmountable obstacle after the next.